In theory, holidays are a time of joy and celebration. In practice, even the most superficial attention to health and nutrition can make the month-long festival of candy canes, chocolate Santas, and seasonal Starbucks drinks a challenge. At first, the idea of “surviving” the holidays seems silly: if they’re that unpleasant, why participate in the first place? But it’s not always possible to opt out of such an important cultural event, and besides, not everything about the holidays is irritating. With some smart planning ahead of time and a little ingenuity, it’s possible to enjoy the good parts of the season without compromising your health. The holiday season presents two main types of challenges. The first one is the general seasonal stress that lasts from Thanksgiving (or even before!) to January 1. Stress reduction is an incredibly important part of the Paleo lifestyle, so just the shopping, cooking, and planning would be challenging enough, but the struggle doesn’t end there: the constant seasonal pressure to indulge in sugary desserts and candies can tempt the most committed of Paleo dieters. The holiday season often brings an intense sense of deprivation when everyone around you seems to be merrily enjoying the candy canes and sugar cookies that you can’t have, and the cultural pressure to experience holiday food as part of the festivities can make you feel socially isolated when you don’t join in. The second kind of pressure is the acute stress of the big family feast. While the seasonal pressure builds up over a month or more, family dinners only last a few hours – but they’re much more intense. For Paleo dieters, traditional holiday dinners become a minefield of food temptations, offended relatives, and rude questions about “this weird new caveman diet.” This is especially true if you’re also travelling, without access to your own kitchen and a place to get away if you need a break. Whether you’re a seasoned veteran or a newcomer approaching your first Christmas without fruitcake, the holidays can be a challenging time to stay Paleo. But you don’t have to give up on your health to enjoy the season: these 12 tips can help you make the most of the holidays without compromising your Paleo goals. It’s important to remember that Paleo is about more than what you put in your mouth. Yes, candy canes are bad for you, but staying up until 4:30am wrapping presents isn’t doing your health any favors, either. The tips below are designed to help you cope with the entire holiday season and the lifestyle challenges that come with it. It might not seem obvious, but these are also crucial steps to surviving the bigger hurdles along the way. Think of sports: if an athlete exhausts himself overtraining in the week before a big game, he won’t perform nearly as well at crunch time. In the same way, if you wear yourself out at the beginning of December, you won’t have the energy and resilience you need for the family parties at the end. The holidays hard enough when you aren’t sick, but just when you least want to come down with that nasty winter cold, you’re in the ideal environment for it. During the weeks leading up to the holidays, most people spend more time than usual packing themselves into small indoor spaces like malls and shopping centers, sleeping at each other’s houses, or crowding into cars for road trips to Grandma’s. Colds, flus, and nastier bugs like pneumonia flourish in that kind of environment. Fortunately, a Paleo diet is a wonderful way to keep your immune system in peak condition – make sure to get plenty of Vitamin D (especially if you live somewhere cold and dark) and Vitamin C. It’s always tough to get enough sleep during the holidays, but sleep deprivation makes you much more vulnerable to disease, so try to get in at least 8 hours every night, or take a nap in the afternoon if you were up late. Regardless of whether or not you indulge in holiday desserts, sticking to your exercise plan will help you handle the stress of the season. Just maintaining your routine can bring an important little bit of sanity to an otherwise crazy time of year. Exercising also releases endorphins, natural mood boosters that help cheer you up on dark winter mornings. As a bonus, many people find that when they stagger out the gym after a hard workout, it’s much easier to make smart nutritional choices because they just aren’t interested in sugary junk food. To keep yourself motivated during the holidays, try setting a personal exercise goal for December, and planning some kind of reward if you make it. Having a definite plan in mind will help you much more than the vague idea that you need to keep up with your workouts. Try shoveling out your driveway as fast as you can on December 1st, and then set an ambitious speed shoveling goal to make by the end of the month (this is also a great way to spread some holiday cheer to your elderly or housebound neighbors). Or get together a group of friends and start your New Year’s resolutions early – you’ll beat the January crowds at the gym, and help each other stay fit and active during the winter. Even if you’re travelling for the holidays, you can still make time to move around. Your grandmother might not have a full set of Olympic lifting equipment tucked away in her basement, but a brisk walk in the snow before breakfast, or an energetic snowball fight will get your blood pumping just as well – if you’ve been pushing yourself athletically in the season leading up to the holidays, this can even function as a deload week, giving your muscles a welcome chance to relax and repair themselves. For a more intense workout, try a run around the neighborhood, or some bodyweight exercises that you can do anywhere: the Angry Birds workout from Nerd Fitness is easily scalable and can be done with only your bodyweight. Think of holiday visits as a beneficial challenge to your fitness routine, and take the opportunity to try something you don’t usually go in for – you might be surprised by how much you like it. Too often, people approach “surviving the holidays” as though they’re powerless to change anything about the season, and they just have to put their heads down and grit their teeth until January. But that doesn’t have to be the case! Sure, the modern holiday season revolves around sugar and candy, but there’s no reason why you can’t find the parts of the season that are actually meaningful to you, and develop your own Paleo-style celebration. The religious tradition of Christmas doesn’t require any kind of special food and a secular celebration of family, generosity, and goodwill definitely doesn’t have to depend on what you eat. Traditional Jewish food for Hanukkah can present more of a challenge, but even if you decide to prioritize religious observance over Paleo, you can still avoid the peripheral cakes, candies, and other non-Paleo desserts while celebrating the season with your loved ones. The key to this is to be proactive about it. Instead of suffering mutely through the commercialized, sugar-laden version of December, try creating your own traditions. Go for a sleigh ride, have an epic snowball fight with all your relatives, or get together to create handmade paper ornaments instead of just throwing a box in your cart at Target These are traditions that appeal to everyone, no matter what kind of food they eat, and you might be surprised at how happy your relatives are to escape the typical Christmas visit activities. Counterintuitively, one of the best ways to handle the holiday stress is just to acknowledge that it exists. The cultural pressure to feel constantly cheerful and merry during the entire month of December is stressful in itself, and dietary pressure is just icing on the cake (the cake you have to constantly resist eating). Almost everyone feels deprived and exhausted at some point. It’s tempting to surround yourself with tough love and white-knuckle it through December: food is nothing but fuel and you only feel so unhappy because wheat is addicting. But food is so much more than fuel. From the beginning of recorded human history, we’ve used food as a tool of cultural exchange – when you turn down the gingerbread at a party, you’re excluding yourself from a cultural connection, and that hurts. Give yourself permission to feel unhappy, lonely, and deprived at times, and those feelings will become much more manageable. It’s also important not to expect perfection from yourself. In the middle of all the craziness, if you give up and just eat a bagel because it’s right there after a marathon shopping trip and you’re starving and exhausted and don’t have the energy to go home and cook, let it go. If you’ve spent the better part of a week fending off your grandmother’s gingerbread and you don’t have the patience to smile about it any longer so you eat it just to get her off your back, let it go. Beating yourself up about it won’t help. Try putting it in perspective: if you’ve stuck to your guns since before Thanksgiving, a few cookies on December 23rd won’t undo all your hard work. Some people might even find it helpful to plan a “cheat” during the holidays. Obviously if you have a life-threatening allergy or intolerance to something, the fact that your mother made it over Christmas doesn’t matter. But if you’ve been eating Paleo long enough to heal your gut from the damage of the standard American diet, and you’re willing to accept the consequences of eating foods you normally wouldn’t, it might not be such a big deal to plan on enjoying some of the holiday goodies all around you. This doesn’t mean that you should binge on everything in sight – pick your cheats carefully, and make sure they’re actually worth it. What’s “worth it” will depend on you – for some people, it might be their grandma’s traditional Belgian chocolate cake; for other people, it might be a well-savored bowl of Ben&Jerry’s. If Reese’s Pieces are really what you want, there’s no point “cheating” with homemade fruitcake and then having to suffer the health consequences even though you didn’t actually get what you were craving. If this sounds like a good way for you personally to maintain your sanity over the holidays, check out the Whole30‘s guide to nutritional off-roading for suggestions on how to “cheat” intelligently. The stress might start after Thanksgiving, but holiday dinners are the time when the seasonal pressure really comes to a head. These visits often bring an intense dose of culturally required interaction with people you know just well enough to be irritated by, in the context of meals loaded down with emotional significance. In that situation, many people will seize on superficial differences as a topic of conversation, since they don’t know each other well enough to have any kind of meaningful discussion. Health-conscious dietary choices are obvious in the context of candy canes and gingerbread cake, so they make for an easy conversation topic (especially for groups trying to avoid touchier subjects like religion and politics). Unless you’re very good at going undercover, chances are that your diet will draw attention at some point. But this doesn’t have to mean gritting your teeth for the next four hours while repeating your answers to the same questions about saturated fat and whole grains. With a little planning and some tactful conversation maneuvers, you can enjoy your meal despite the non-Paleo foods present and the people who might pressure you to eat them. Simply put, a food pusher is someone who pushes food on you – someone who won’t stop trying to make you eat something even though you’ve already politely refused. Chances are, if you have to attend any kind of holiday party, you’ll run into at least one food pusher. Ironically, the real issue behind a food pusher’s behavior often has nothing to do with food. It doesn’t seem obvious when Aunt Susan is waving her tray of pumpkin spice cookies under your nose, but food is often just a proxy. Sometimes, food pushers want assurance that you like and appreciate them. This often takes the form of a guilt trip: “What, you don’t even eat Christmas pudding now? But I made it just for you! You don’t like my cooking?” This person is using food because it’s the cultural language of choice during the holidays, but really, they just want emotional reassurance that you care. Fortunately, you can address their actual concerns just as well without eating (maybe by spending quality time with them during your visits, or just by letting them know you love them), and head off a battle before it starts. Other food pushers really want to feel better about themselves – they see that you look and feel amazing, and they’re jealous, so they try to pull you down to their level. This is petty and low, but unfortunately, it’s very common. Some people just want to show off how much they know (or think they know) about nutrition by “proving” you wrong however they can to make themselves feel important. Other food ushers are genuinely concerned for you: they’re worried that if you aren’t eating dairy you might not be getting enough calcium, or they honestly think you’re missing important nutrients by giving up whole grains. Another kind of food pusher might feel bad for you – she thinks you’re depriving yourself, and wants you to have a good time like everyone else. How you respond to someone pushing food on you will depend on why they’re really doing it – if they actually think you’ll enjoy a brownie, they’ll offer you the plate once and not make a big deal out of it when you refuse. But if they keep pushing it, there’s something bigger than the food itself at stake, and you can respond to it much more effectively if you understand what it is. By addressing the actual issue at hand, you can address their actual concern without eating something that makes you sick. When it comes to surviving holiday dinners, potluck parties, and almost every type of food pusher, “no, thank you” is one of the strongest weapons in your arsenal. You are an adult. You decide what you do and do not eat. You don’t need to justify anything; you don’t need to deliver a doctoral dissertation on the molecular structure of gluten or the role of lectins in autoimmune-related gut irritation. It doesn’t matter why. All that matters is that you’re an adult, and you choose to eat some things and not others, full stop. At first, this seems like it shuts down debate – isn’t it good to discuss your life choices with people who disagree, to challenge your own beliefs instead of dogmatically clinging to your right to have your own opinions? Some of the time, yes. If you’re blessed with relatives who can discuss dietary differences of opinion in a calm and rational way, take full advantage of your good fortune. But it just isn’t always possible to have an honest and productive conversation about diet. Food pushers don’t care about your health; they just want to satisfy their own emotional needs by getting you to eat something. It has nothing to do with whether the food is healthy or not. When you try to argue with a food pusher on nutritional grounds, it’s like trying to explain to an avalanche why it shouldn’t hit you: you might as well save your breath. Don’t ruin your own evening by getting caught up in the argument. A great combination move for “No, thank you” is “…but how do you like your new job?” Or “…but how’s your home renovation going?” or “…but I heard you’re going to Hawaii in the spring?” or any other kind of open-ended question that has nothing to do with your diet. If you try to justify your choices, or if you just leave it at “no, thank you,” you’re leaving the topic open for debate, as though it were ok for the other person to keep asking questions about it and try to persuade you that you’re wrong. That’s not the message you want to send. By bringing up a new topic (preferably something really juicy and interesting so they forget all about the cookies), you can deflect attention from the food and forestall an argument before it starts. Another way to handle people pushing food on you is to use the magic word: “later.” Claim that you’re completely stuffed, but you’d love to take home some leftovers. Then when you get home, you can just throw away whatever they sent you home with, avoiding a conflict while keeping your diet intact. In some ways, this seems like a sneaky, dishonest way out, since you’re deliberately misleading someone into believing that you’re going to eat their marshmallow pudding. Whether you feel comfortable with this as a “white lie” or not is up to you, but keep it in mind as a potential strategy for handling people who just won’t give up. Blanket statements that “[food x] is unhealthy” are likely to make other people very defensive. They’re inviting argument: if you claim that “grains are unhealthy” surrounded by a group of relatives munching dinner rolls and lasagna, you’re asking to start a big argument about whether or not grains are healthy in the abstract. Everyone else will naturally try to defend their dietary choices. Instead, try making it personal: “I don’t feel well when I eat gluten.” Nobody can argue with you about that. Nobody can claim that you’re wrong. Of course you know that you feel sick eating gluten because grains are unhealthy, but you don’t have to bring that up at the table. If a simple “[food x] makes me feel sick” doesn’t work, some people bring out the heavy artillery and pretend to have a life-threatening condition like Celiac Disease or a peanut allergy. Pretending to have a serious allergy when you don’t is a very controversial strategy, since many people feel that it’s “crying wolf,” making others less likely to believe people who actually do have life-threatening problems. On the other hand, it’s a very effective way to shut down debate and attempts to persuade you that “just a little bit won’t kill you” or “it’s the holidays; lighten up.” People respect a physical disability more than they respect the attempt to stay healthy; you shouldn’t have to pretend to be Celiac just to get out of eating cookies, but sometimes you do. A lot of dinner-party pain is avoidable with some simple forethought. If you’re travelling at all for the season, it’s especially important to come prepared with everything you need, since you might not have the opportunity to find much Paleo food while you’re there. Plan ahead and stock up on jerky, trail mix, and other easily portable Paleo snacks so you won’t be stuck without a Paleo option when you’re hungry. If you’re going to help with the cooking, try bringing your own coconut oil or other cooking supplies: most people are perfectly happy to substitute coconut for canola (or another toxic vegetable oil). If you can work out menu details with your host, so much the better – try requesting eggs for breakfast, or lots of salad ingredients so you can whip up your own lunch in a pinch. Most hosts want their guests to feel welcomed and relaxed, and they’ll be happy to make these kinds of arrangements within reason. If you’re hosting the festivities, you’re in luck: with all the advantages of your home turf and no need to lug coolers full of food from state to state, you can enjoy your own cooking without the fear of mystery oils or hidden gluten. If your guests aren’t Paleo, you might have to make some concessions to the food they’re used to eating, but if you don’t make a big deal out of your special diet, most people won’t object to omelets for breakfast, or lunches and dinners of hearty roasts accompanied by some safe starches like rice or potatoes. You might even find that your guests are relieved at the healthy food, because it gives them less trouble in sticking to their own health and fitness goals. Many people worried about surviving the holiday season forget that others are also struggling to maintain healthy eating habits – if you were the only one, you wouldn’t be able to find nearly as many blog posts about it. If your relatives bring dessert foods (as many people do), you won’t even need to buy any; otherwise, try serving some Paleo chocolate pudding or berries with whipped cream. Even if you have to buy a few loaves of bread or some muffins for the picky eaters in the house, it’s easy enough for you to avoid the side dishes if the main meal is Paleo. Mental preparation is also key to navigating the inevitable dinner-table comments about your “caveman diet.” Before you head off to your relatives’, brush up on the latest topics of interest so you’ll have a ready stash of subjects if you need to change the topic. Even if you don’t personally care about the Petraeus scandal or your uncle’s favorite football team, they’re more pleasant to hear about than how you’re killing yourself with all that saturated fat. It’s also helpful to decide in advance how far you’re willing to make dietary concessions. Have a strategy in place for what you’re going to eat and what you’re going to turn down; don’t wait to make your plans until everyone is waving pie and cake in your face and you’re already hungry. Planning your visit ahead of time – including when (if at all) you plan to deviate from a strict Paleo diet – will save you a lot of pain down the road. Paleo dieters and vegans don’t generally have much in common, so the advice to stick together might seem ridiculous at first. But in the context of overly-nosy relatives, your vegan (or macrobiotic, or Kosher, or Atkins Diet) relatives are probably suffering from the same nosy comments and other annoyances that you are – which means they probably sympathize with your irritation, if not your plate full of ham. Try striking up a conversation about how annoying it is that everyone feels the need to comment on your food choices, and then finding something totally unrelated to talk about – which both of you will probably be longing for at that point. Note that this tactic depends on the person in question – some vegans, just like some people of every other dietary persuasion, are passionate evangelicals and will simply seize the opportunity to lecture you about how unethical and unhealthy your Paleo diet is. But there are also a lot of vegans in the world who don’t approach their diet with near-religious fervor, and just want people to stop asking them why they won’t eat the turkey. Finding someone who shares your pain and engaging with them removes you from the people picking at your eating habits and might even lead you to a new friend. 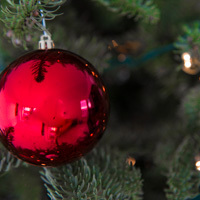 It’s unrealistic to expect that the holiday season will go smoothly from start to finish. Even if you do everything right, something will inevitably happen that throws you off – maybe your in-laws turn Christmas dinner into a political clan war, or your kids bring home a nasty case of the flu from school and lay you out for a week. But taking care of your health with a Paleo diet will give you the energy to handle the rough spots, and appreciate what you do like about the season. And as a bonus, January 1 will be so much more pleasant when you’re already set in a healthy routine, instead of trying to get back on track after a month off.